I like this recipe “To make a Gooseberry Fool.” Slap dash. No nonsense. Take two quarts of gooseberries, set them on the fire in about a quart of water. When they begin to simmer, and turn yellow, and begin to plump, throw them into a cullender to drain the water out: then with the back of a spoon carefully squeeze the pulp, throw the sieve into a dish, make them pretty sweet, and let them stand till they a cold. In the mean time take two quarts of new milk, and the yolks of four eggs, beat up with a little grated nutmeg, stir it softly over a slow fire, when it begins to simmer, take it off, and by degrees stir it into the gooseberries. Let it stand till it is cold, and serve it up. If you make it with cream, you need not put any eggs in; and if it is not thick enough, it is only boiling more gooseberries. But that you must do as you think proper. 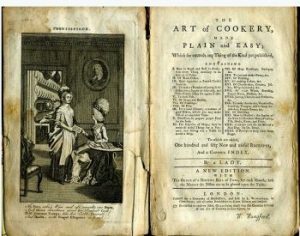 Check this SITE for some of Glasse’s recipes for use today: turnip soup, artichokes, stuffed savoy cabbages, and Portugal cakes. You may want to subscribe to this blog: Jenny McGruther is a wife, mother and cooking instructor specializing in real and traditional foods. Her first book, The Nourished Kitchen features more than 160 wholesome, traditional foods recipes.